PUNL is pleased to have completed the installation of the 30kWp PV solar array at The Caversham Group Practice mid-March 2019. 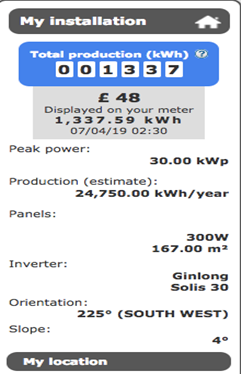 The site has been registered for the Feed-in Tariff and the panels are generating solar electricity and performing well with 1337kWh of solar electricity had been generated in just under three weeks. During April, PUNL will install an electronic display in the reception area of the Practice which will show the CO2 savings, the solar energy generated in both real time and in total. PUNL has an annual operation and maintenance contract for the panels and this will mean their performance will be regularly monitored to check they are working at the correct level. On 3 April, PUNL organised a small investor celebration at the Practice to thank funders and investors for their support. The event was well attended and Ben Pearce (PUNL’s Chair) took the opportunity to thank investors and funders. PUNL could not have done this project without the support of the GLA who funded the feasibility work and Sylvia Baron was thanked. Thanks also went to Claire Hanratty and her team at Pure Leapfrog and Simmons & Simmons for providing a grant to support the cost of the solar panels. Dr Alex Warner, Dr Jane Myat and Sheetal Shah from the Caversham Practice were thanked for their support and determination to see this project through along with shareholders for their investment in the panels without which the project could not have been delivered. Shareholders should note that share certificates will be sent out to new investors this week. The £28,000 target for the Community Share Offer for solar panels at the Caversham Group Practice, in Kentish Town, Camden has been reached 11 days early. PUNL would like to thank the 39 investors who made this happen, along with support from Keir Starmer, local councillors and many people from the local community. Caversham Group Practice Share Offer – Invest now!! PUNL is launching a Share Offer to raise £28,000 for a 30kWp PV solar array on the south and west facing roofs of the Caversham Group Practice. This is the result of 15 months of work from initial conversations with the Practice, to a successful application for feasibility funding from the GLA, completing the feasibility with a green light to proceed and putting the legal documentation in place for a lease between Caversham and PUNL. We are now moving to the installation phase and must raise the necessary funds for the solar panels, electronic display and fundraising costs. The share offer is time bound and will open on 23 January and close on 15 February, or when the target is reached, whichever comes first. The minimum investment is £250 (1) and the maximum investment is £3000. We invite you to invest in this important project with environmental, social and financial benefits for the Practice and the local community. For now, register your interest here to find out first when the share offer launches. City farm success | LUX hopes | Caversham roof | Energy workshops | Hydro here? The planning application for 42 solar pv panels on the roof of the existing stable block at Kentish Town City Farm was successful. Pv panels will cover the southern roof-slope of the existing single storey stable [each panel measures 991mm by 1.65m with a depth of 35mm]. There were nine letters of support and no objections. The installation is set to provide 11.34kWp of renewable energy. The proposed installation has a capacity of 34.29 KWp and is estimated to provide 22.82 MWh of electricity which can be used on site to reduce energy costs, saving over 12T of carbon dioxide emissions. PUNL estimates that between 60% to 70% of the 22.82 MWh generated by the panels can be used on site, resulting in financial savings for LUX and London Borough of Camden, through reduced energy supply costs. PUNL proposes to investigate the possibility of installing battery storage to cover night-time electricity use, including the charging electric vehicles to help tackle pollution in the park. Thanks to those who have submitted communications in favour of the panels. On the Caversham Practice proposal, the structural survey was sound, meaning pv panels can be put on the roof. The next phase will be determining the optimal Kwp of the PV array and fundraising. PUNL, with the help of a grant from Islington Council, and Thinking Works organised two energy efficiency workshops for local residents at Caxton House. Attendees were shown the various different parts electricity bills and what they actually mean in practice, including obscure clauses, and then some common appliances and how much energy on average they consume. Information about switching supplier was also provided. PUNL features in the Camden New Journal (July 5 issue, page 8) on its thoughts on a potential hydro-electric project in the area, using the underground river Fleet as the power source. The article points out that hydro-power was used in the area historically. PUNL is investigating the possibilities and feasibility. Power Up North London has been given funds from Islington’s Community Energy Fund for a replacement lighting project and feasibility studies for solar panels and battery storage at three other community buildings in Islington. It follows PUNL being awarded London Community Energy Fund grants for feasibility studies for three buildings in Camden. The buildings/blocks are: Caxton House where LED lights will replace existing lighting, Elizabeth House, Elthorne Pride and Whittington Park Community Association which will undergo tests for solar panel potential, including storing the renewable energy in batteries onsite. The fund is provided by the borough’s carbon offset fund – money paid by developers to offset the emissions they generate while building. “I’m already looking forward to seeing these projects come to fruition, and hearing about other schemes and bright ideas for generating power at a local level, cutting energy bills and reducing the borough’s carbon footprint. Power Up North London (PUNL) has been awarded £34,140 by the GLA’s London Community Energy Fund for feasibility studies for putting solar panels on three buildings in Camden. The mayor awarded a total of £150,000 to 13 solar energy projects across eight London boroughs. PUNL was awarded £12,940 to investigate putting solar panels on the roof of the Caversham Group Practice (CGP), an established teaching and training practice in Camden with 15,000 registered patients. The community energy group estimates the panels (29kWp) will save 20-25% on the practice’s electricity bills. It is also looking at the use of battery storage. At Kentish Town City Farm, a community charity that helps city people connect with animals, nature and the environment, the study (£9700) will be focused on whether a stable block can support solar panels (11kWp). The block is in a highly visible position enabling the promotion of renewable energy technologies to visitors. 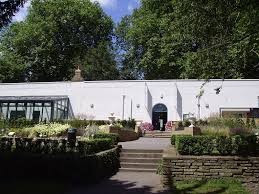 And at the LUX Centre, an international arts agency in Waterlow Park, PUNL has been awarded £11,500 to investigate the feasibility of installing 34kWp of solar panels. It will also look at the possibility of installing battery storage that could enable charging electric vehicles overnight to help tackle pollution and clean up the air in the park. This project should result in financial savings for LUX that will be reinvested in community events and other energy efficiency initiatives. Ben Pearce one of the PUNL directors and secretary said: “Power Up North London is delighted that our three applications to the London Community Energy Fund were approved by the GLA. We are now looking forward to working with the three sites to explore the feasibility of solar PV installations and will also assess the potential for battery storage. 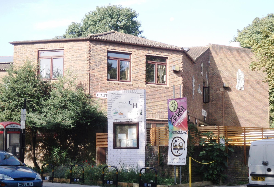 “The three sites, Caversham Group Practice, LUX (based in the Waterlow Park Centre) and Kentish Town City Farm are all community sites that deliver positive social impact for their users. They are all committed to combatting climate change and supporting those in need within our community.